Photo courtesy of Eric Smalls. For Eric Smalls ’16, founder of the Stanford Robotics Club, robotics was never just a hobby — it was the path to a better life. Photo courtesy of Soo Ji Lee. In October, Smalls was featured in a campaign video for President Barack Obama titled “Dear Mr. President,” which has collected more than 67,000 views on YouTube. In the video, Smalls described his experiences on his distinctly non-traditional path to Stanford. After his mother died when he was three years old, Smalls lived out of a car with his father and sister, sharing less than $2 a day for food. “Those years were very difficult, and college was just a pipe dream,” Smalls said in the video. Smalls eventually moved in with his grandmother in Philadelphia and was admitted to the George Washington Carver High School of Engineering and Science, where he served as president of the robotics club. After building his first fully functional robot in just one night, Smalls discovered his passion for robotics. In the video, Smalls thanked Obama for the science, technology, engineering and mathematics (STEM) initiatives that provided financial support to his high school and allowed him to continue to pursue his interest in robotics. When Smalls arrived at Stanford for Admit Weekend last year, he was surprised to discover that his dream school was missing the student group he wanted to join the most: the robotics club. Smalls gathered a group of students interested in robotics and submitted a petition to become a voluntary student organization (VSO) in October. The application was accepted in December. In the three months since its founding, the Stanford Robotics Club has grown to 65 active members and has raised over $27,000 through departmental and industry sponsorships, including $5,000 sponsorships from the Department of Computer Science and the Department of Mechanical Engineering. The group has also garnered the support of the Department of Electrical Engineering, which has granted club members 24-hour access to space in the basement of the Packard Building. The Department of Mechanical Engineering has also allowed the club to use its Product Realization Lab. The club was officially registered as a VSO a week after Smalls took second place at the DroneGames, a programming competition in San Francisco. At the competition, Smalls collaborated with John Backus ’16 and Omar Rizwan ’16 — who recently took a leave of absence to become a Thiel Fellow — to control multiple drones from one computer. The team competed against employees from Twitter and Facebook. After his success at DroneGames, Smalls started a quadrotors — a type of drone aircraft — team. One of the team’s projects is the “Ikescopter,” which the team hopes will eventually be able to deliver an Ike’s sandwich order from a smartphone. 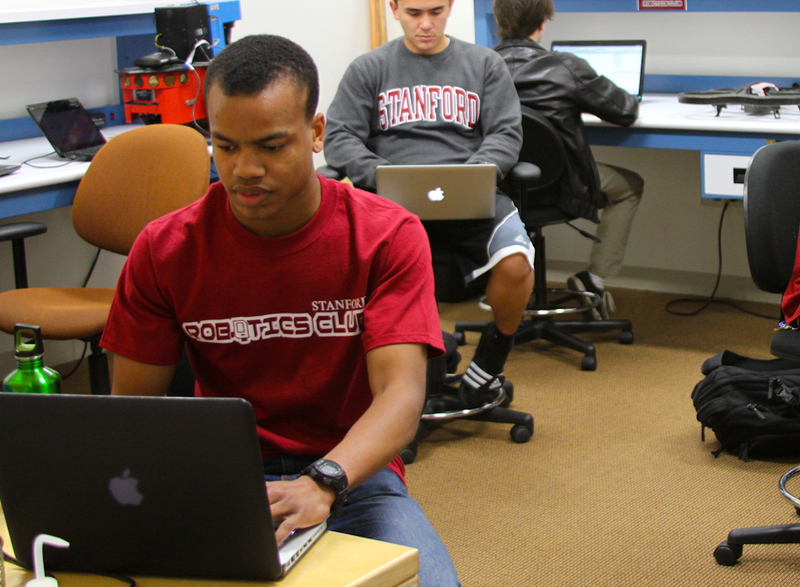 Although the group remains busy building projects and entering competitions, Smalls said that the Stanford Robotics Club has also focused on outreach. The club has hosted monthly tech talks and weekend workshops open to Stanford students interested in learning more about robotics. In January, the club launched the “Build Tech Grants,” a new grants program for Robotics Club members looking to build their own projects. Applications for the grants closed on Feb. 1, and more than $3,000 in grant money was awarded. The Stanford Robotics Club also plans to enter future competitions such as the DARPA Robotics challenge, where club members will be required to build a humanoid robot. The winner of the competition receives a full-size humanoid robot from Boston Dynamics, which Smalls said would give the club an opportunity to expand. “If we win the humanoid robot, then we can ask for more space because it’s getting pretty crowded between all these competitions and projects as we expand,” he said. Backus praised Smalls’ efforts, and said that Smalls’ dedication has played an integral role in the club’s success thus far.